Foodpro began production late 2012, and was assisted in its development by fellow ACA member Jungle Nuts, an ACA Seal-certified cashew processor in Kenya. Mr. Olajiga describes the advice and support provided by Jungle Nuts as “instrumental” in helping FoodPro refine its business model and continuously improve the quality of its output. Foodpro’s main customer base is currently the UK market, although domestic sales are also growing in response to an increasing demand for processed cashews within Nigeria. The company is expanding quickly – while at the beginning of 2014 FoodPro employed around 100 staff, it begins the New Year with a workforce of 287 people, 88% of whom are women. Assisted by ACA Seal Coordinator Peter Nyarko, FoodPro implemented further changes in all areas of the factory, ranging from establishing an on-site laundry and introducing colour coded overalls, to redesigning internal reporting procedures. New talent was recruited in the area of quality assurance, section supervisors were empowered to take ownership of various stages of output, and an overall culture of inter-departmental collaboration and cooperation was fostered. Equipment was upgraded, and automation increased in a number of sections, while regular training was introduced for all levels of staff. Since entering the Seal program, FoodPro has increased its production from 0.6 tonnes per day to 4 tonnes per day, and expects a further threefold increase in output in the coming year. Surveys have revealed increases in both customer satisfaction and employee morale, sale prices have risen, and new potential customers have approached the firm with purchase enquiries. Ongoing compliance with Seal standards is ensured by daily quality reporting, both by section supervisors and by the firm’s new Quality Assurance Manager. The firm plans to also introduce random monthly Seal audits in 2015 to further strengthen guarantees of quality. As will be familiar to many cashew processors across Africa, a major challenge facing FoodPro is the issue of poor quality kernels being harvested at farm level. “A good process cannot make a bad quality cashew good,” says Mr. Olajiga. 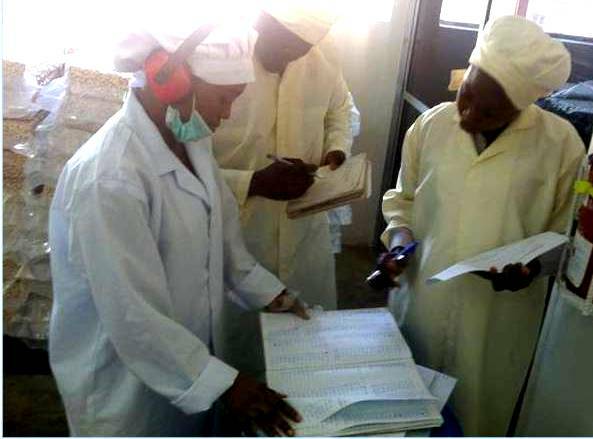 To address this challenge, FoodPro has partnered with ACA and Nigerian government agencies to work directly with farmers, providing training in pre- and post-harvest cashew handling, thereby ensuring a rise in both harvest quality and farmer income, and also contributing significantly to the long-term sustainability of the Nigerian cashew industry as a whole. Another challenge facing the company is the lack of skilled and experienced workers in the cashew processing sector. Mr. Olajiga notes that assistance from both ACA and Kenya’s Jungle Nuts have helped FoodPro provide workers with the training necessary to ensure the sustainable growth of a skilled workforce. The future for FoodPro is very bright indeed. The company expects to double its annual production output in 2015, and has a three-year plan in place to increase output from the present level of 1,500 tons of RCN to 10,000 tons. Further medium-term plans for the company include extracting cashew shell oil to convert into renewable energy for the factory, and launching a major branded retail product on the Nigerian market. But over and above the standard business targets, FoodPro has a vision for a company which delivers benefits to all its stakeholders. Says Mr. Olajiga, “We want to have a company where our employees are proud to work, our customers receive more value than they pay for, and shareholders receive good return on their investment."